I'm Rae. I make fonts and blog. I reside in a city on a lake but spend most of the time living in my head. I'm Rae. I make fonts & blog. I reside in a city on a lake but spend most of my time living in my head. Days 5 and 6 found us in Anchor Point enjoying a quieter end to our trip. The weather was still good but cloudy. Made us appreciate the amazing weather we had for our landing on Denali. I grew up in a small town. Anchor Point has that beat. I asked Mike to drive me through downtown. He said he already had. He explained that it was the grocery store, the post office and the drive up coffee shop. We were in and out of Homer which was 15 miles away. The fish are halibut. Spent time with our host's faithful companion Quex. More great meals in Homer. We made homemade ice cream. Went to the farmer's market. Ralph, Erica and John golfed in Anchor Point. Stocked up on our souvenirs, did laundry and got ready to leave. Days 7 and 8 saw us heading back to Anchorage to fly home. If my calculations are right we drove approximately 800 miles. Our route was Anchorage - Talkeetna - Seward - Anchor Point/Homer and back to Anchorage. We got to be in Alaska on the equinox. Eight days of never-ending daylight. We had our last meal in Anchorage in a dark steak restaurant. We then walked out into blinding sun. I remember thinking, enough already. Aside from that one thought I did enjoy all that daylight. There was not one disappointing moment on this trip. Not one. Many reasons for this ... great traveling companions, a beautiful state and our gracious host who dearly loves Alaska. I'm Rae. I make fonts and blog. I reside in a city on a lake. But spend most of the time living in my head. Day 3 was a travel day. But one where we stopped for endless photos and had lunch at the Alyeska Ski Resort. We took the Tram Dine and Ride which took us up the mountain for lunch. We ended that day in Seward. Everything is crazy far away from the next thing in Alaska. Alaska is bigger than Texas, California and Montana put together. Day 4 was a boat ride out of Seward. John is going to tell you about this because I didn't go. I barely make it to the top of Denali so opted out of a 6 hour boat ride. John: This is the Holcroft Glacier. Our destination for the ride. I chose this photo in part because of the boat in the foreground to give some perspective to the majesty! This is about a quarter mile high at this point with a river running underneath. So breath taking. We encountered whales, a pod of Orca, porpoise, sea otters (which are quite large) as well as two types of seals and countless birds. Everyone liked the puffins. ...this second video as we are about to leave. Just so beautiful! Undoubtedly, better pictures have been taken. More eloquent words have been written. But my experience on this trip was spiritual. Not in a religious manner per se but in the wonder of all creation. No matter your belief or lack there of, there is no denying this world's splendor. Day 2 starts like every other day with a hearty breakfast. It often includes Reindeer Sausage. I need a good breakfast because we are off to take an Air Taxi to Denali. No matter how amazing I thought this would be it truly exceeded all expectations. I really do not have words to describe this experience. There is something about these vistas, all that wide open space. So moving to experience this. I did not know that the mountain is only out 1 in 3 days. So for us to get 3 days of cloudless blue sky is very special. All videos shot by John Ganahl. Really interesting to see these blue glacier ice pools. We were no where near these and this was shot from the plane. You can read more about them here. This spectacular day ended with my favorite meal of the trip. Maple Glazed Salmon with Scallop Stuffed Shrimp. Day 1 starts with John and I and our good friends and neighbors heading out at 4:40AM for an early flight out of Madison which continued on to Minneapolis and landed in Anchorage. It is nearly impossible to take a bad photo. Pretty much point and shoot. We were met by Mike who whisked us off to lunch near the airport at The Flying Machine. I had a very nice seafood salad. And then back in the car and on to Talkeetna, AK. If you want to take photos of your food, and who doesn't, use this app InstaFoodPro. You get it through iTunes. The app recognizes where you are and adds the copy. You get to choose the layout. Sometimes it does have a problem with location and I have no idea why. For the most part it works well. Our long day ended at the very nice Talkeetna Alaskan Lodge. Behind this fireplace is a row of rocking chairs where you can take in the view inside or outside on the deck. Early to bed. Right now it does not get dark there. I could not wait to experience this. At 1:30AM I woke up and decided to wander around to see what it looked like. 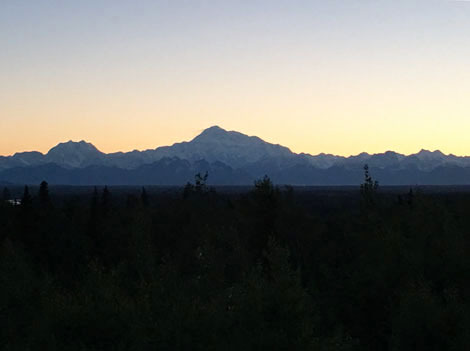 And this is what Denali looked like. I was almost completely alone in that silence soaking in that vista. My Mom always had a box of cards on hand. So, of course I do too. Birthday and all occasion blank cards. 8 for $19. You can order 2 of each card or a box of one design. I especially like to have birthday cards ready to go. Anything to make life a little easier. Drop Rae a line to order. Use the Ask Rae link above. Sign up with your name and email address to receive news and updates. We don't spam. We respect your privacy. We don't spam.